AMSTERDAM and LAS VEGAS, Sept. 11, 2017 /PRNewswire/ -- Royal Philips (NYSE: PHG, AEX: PHIA), a global leader in health technology, today announced its presence at the Vascular Interventional Advances (VIVA 17) Annual Conference in Las Vegas, Nevada from September 11 – 14, 2017, applying advanced technologies and deep clinical insights to address peripheral vascular needs. With the addition of its recent acquisition, Spectranetics, Philips will for the first time highlight its expanded portfolio of interventional X-ray systems, advanced catheters for measurement and therapy, clinical informatics, and services, including its Philips Azurion image-guided therapy platform, intravascular ultrasound (IVUS), Phoenix atherectomy system, and Spectranetics' Stellarex drug-coated balloon. More than eight million people in the U.S. alone are affected by peripheral arterial disease (PAD) . Many people do not experience symptoms and are not aware of even having the disease. In addition to having limited blood flow to the leg, patients are at increased risk for heart attack or stroke. Fortunately, PAD can be accessed and addressed through innovative solutions using minimally invasive procedures like atherectomy and imaging technology that may offer more accurate and reliable treatment options that can reduce recovery time for patients. "At VIVA 17, we will share our expanded Philips and Spectranetics image-guided therapy portfolio enabling clinicians to decide, guide, treat and confirm the appropriate peripheral vascular therapy for patients around the world," said Christopher Barys, Image Guided Therapy Devices Business Leader for Philips. "Our innovative therapeutic solutions are focused on delivering improved clinical and economic value and enhanced care." On Wednesday, September 13, 2017, as part of the VIVA 17 Late-Breaking Clinical Trials program, Marianne Brodmann M.D., of the Medical University of Graz in Austria will present two-year data from the ILLUMENATE European randomized clinical trial (EU RCT) that evaluates how Spectranetics' Stellarex drug-coated balloon restores and maintains blood flow to arteries in patients with PAD. Stellarex received FDA approval in July 2017. The ILLUMENATE EU RCT analyzes patency in the segment of diseased artery treated with Stellarex in over 300 patients from a challenging patient population. Stellarex delivers top-tier clinical results for common to complex patients. As the only commercially available drug-coated balloon with two reported randomized controlled trials, Stellarex has demonstrated durability with consistently high patency rates in a wide range of patients. 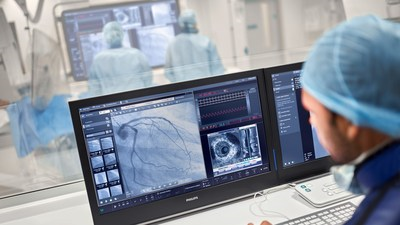 Azurion is the next generation image-guided therapy platform, which enables clinicians to easily and confidently perform a range of routine and complex procedures, helping them to optimize interventional lab performance and provide superior care. The Pioneer Plus catheter is the only re-entry device with intravascular ultrasound (IVUS), a catheter-based imaging technology that allows physicians to visualize diseased vessels from inside the artery, to facilitate identification of true lumen location. The Phoenix atherectomy system, which combines the benefits of existing atherectomy systems, delivers a unique, hybrid  atherectomy option to help physicians tailor the treatment approach for each patient. SymphonySuite is Philips' comprehensive program that includes a robust set of tools to support efforts in opening, growing and maintaining office based lab solutions. Philips will hold a late-breaking clinical trial press conference at VIVA 17 on Tuesday, September 12 at 3:30 p.m. PT to discuss the findings from the ILLUMENATE EU RCT. Additionally, Philips will host a VIVA Lunch Symposium on at >span class="xn-chron">12:00 p.m. PT in Montrachet 2 to showcase the latest findings in the Phoenix atherectomy system, Pioneer Plus, IVUS and more. For more information about Philips' presence at the show, visit http://philips.to/2wM0L8a. Visit the Philips and Philips Spectranetics booths (406 and 405) and Montrachet 2 in the pavilion to experience innovative solutions that deliver the full health continuum in the vascular space. Follow the #VIVA17 conversation on @PhilipsLiveFrom throughout the event. Royal Philips (NYSE: PHG, AEX: PHIA) is a leading health technology company focused on improving people's health and enabling better outcomes across the health continuum from healthy living and prevention, to diagnosis, treatment and home care. Philips leverages advanced technology and deep clinical and consumer insights to deliver integrated solutions. Headquartered in , the company is a leader in diagnostic imaging, image-guided therapy, patient monitoring and health informatics, as well as in consumer health and home care. Philips' health technology portfolio generated 2016 sales of >span class="xn-money">EUR 17.4 billion and employs approximately 71,000 employees with sales and services in more than 100 countries. News about Philips can be found at www.philips.com/newscenter.